Buy the Farm . . . Share: What Does the Wombat Say? What Does the Wombat Say? The house hunt continues. After putting in a bid on a house, and filling out dozens of forms and assurances that we would not rent the place out as a youth hostile or as a base of operations for a biker gang, the sellers accepted another offer. Which is to say that they accepted a higher offer, I'm doubting they just liked the cut of the other peoples' jib quite that much. This afforded Jen and Lauren to spend some time house hunting while I was at work. 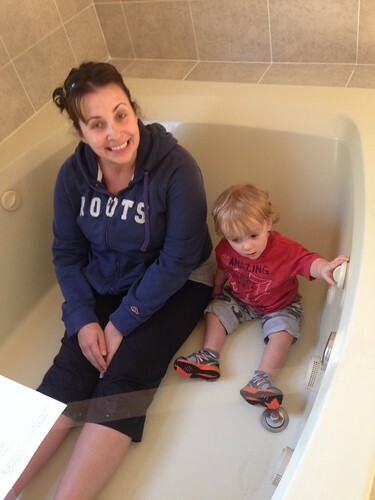 They even took a sick Martin with them to measure the size of various tubs. 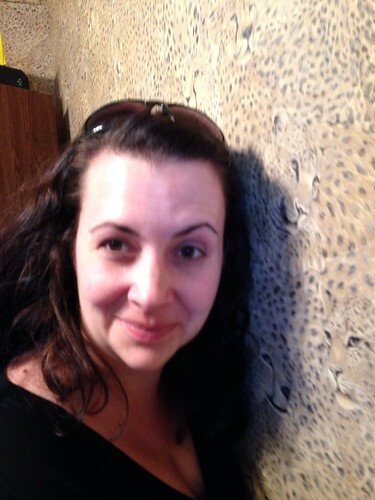 They also saw some of the most comical houses yet including this incredible leopard wallpaper . . .
. . . and this surprise bonus wizard hiding in one of the closets. 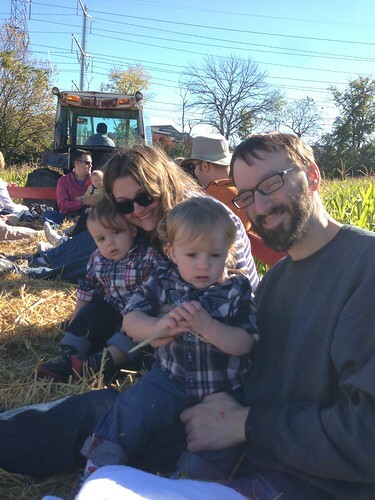 Before work one day I was able to accompany everyone to Johansen Farm where we took a hayride, something that both entertained and confused the boys. It is interesting to compare them with their cousin Evelyn who is one year younger than them and just accepts everything as it comes, so long as there is a bottle involved. The boys knew something was weird and did not quite know what to make of it. This has its pluses and minuses. 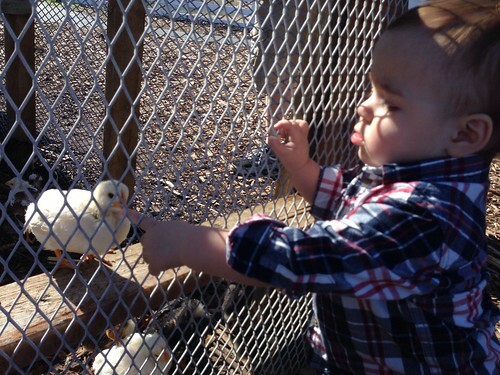 Elliott bravely stuck his fingers through the wire at the petting zoo and allowed a chick to peck at it. He made it through the day with all his digits and without a tear shed, well at least not because of being pecked. 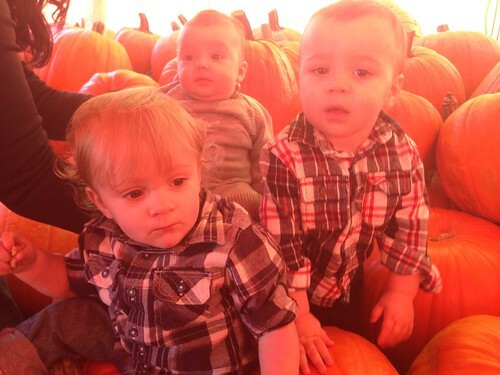 Amongst the pumpkins at the farm we staged the first of a long future of staged photos of the cousins. Sadly, this photo was the best in the bunch for that day. We got some cider donuts, a nice Sunday morning treat to replace the delicious waffles which they (and we) have been missing from New York. Elliott had some donuts too but he also went around grabbing all of the gourds and licking them. We felt guilty and kept track of all of the ones he licked and ended up buying them all. I fear we may have missed a few and thus allowed Elliott to spread the horrible disease which was brewing inside of him that day. 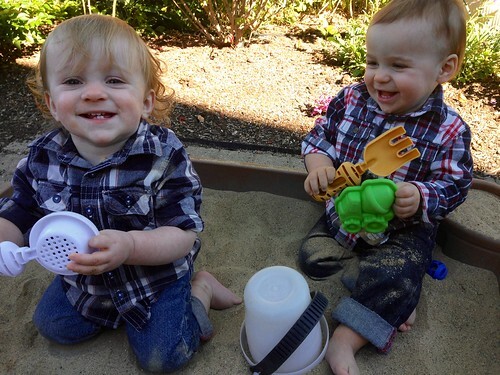 Even though it's getting chilly out the guys are still having a blast in their sandbox. They spend upwards of five to ten minutes in it sometimes before stealing something from one another and freaking out about the injustice. Martin has decided that he knows hos to flawlessly immitate what it looks like when adults drink from cups. Apparently it involves a lot of coughing for some reason. Also, Martin has some up with a great new way to pet a dog which involves alternating bare hands and coasters he has stolen from grandma. Monday night, before I left for my work trip to Atlanta, we celebrated Canadian Thanksgiving. 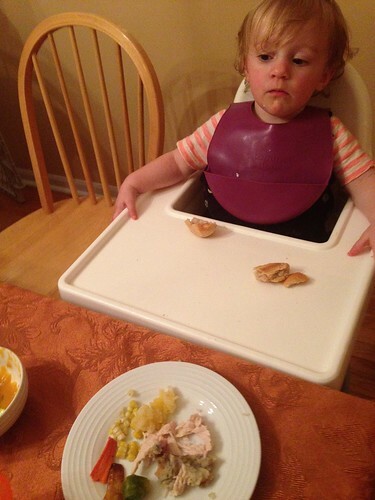 Martin was just getting over his hand, foot, and mouth disease enough to enjoy it a bit. Elliott spent a great deal of the meal sitting on Grandad and trying to remove any plates or cutlery from the immediate area. While Martin stayed home sick, Elliott, apparently took to painting in pink. At our new day care every week has a theme color. This is great but it means that Jen and I do a very half-assed job of completing our homework which is to send them in dressed in the color, or with items of that color, or with a food of that color, depending on the different days of the week. I'm just hoping that the slapdash job we do of throwing this stuff together does not identify us instantly to the day care workers as horrible parents. 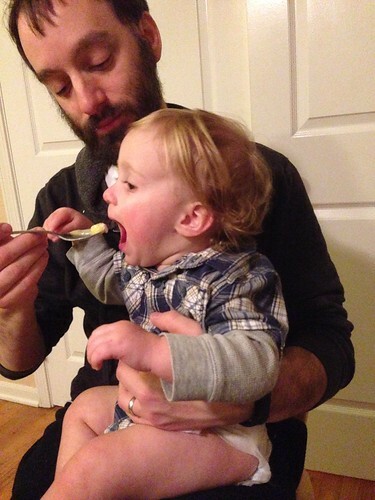 As son as I left town on Tuesday, Elliott began showing signs of hand, foot, and mouth. While his fever did not get as bad as Martin's he apparently developed mouth sores that caused him to scream and be extremely irritable around the clock. For four straight nights he did not sleep more than 30-40 minutes at a time. By the time I returned from Atlanta Jen was just a shell of her former self and Elliott had certainly seen better days. The next night was all mine to stay up with the guy as he kicked, screamed, and did anything but sleep. I had Friday off of work so, after touring three potential houses with our realtor, we spent the bulk of the time on the couch. 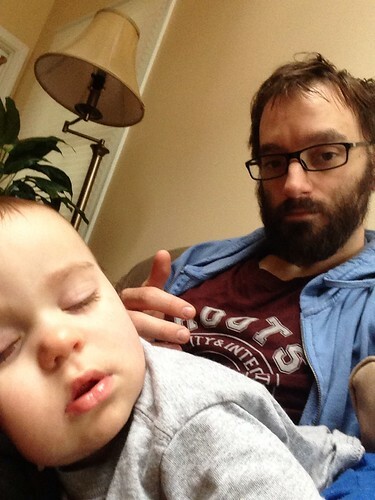 When Martin was sick there was only one thing that he wanted to do besides snuggle with me, and that was to watch "The Fox" by Ylvis on Youtube. When Jen's mum left me alone with him sleeping she left the TV on and I was forced to watch the Today show since I could not reach the remote. While I had heard the chorus of "The Fox" several times I hadn't heard the song in its entirety until I watched Ylvis perform it on the Today show. Martin was instantly hooked and, I'd be lying if I said I was not intrigued as well. I used this same trick for Elliott too, playing this when he screamed which would immediately make him stop, focus on my iPhone, and often fall asleep. After a few days Elliott began to have periods where he would actually start walking again and could be more easily distracted. This meant that I basically let him do whatever he want just so long as he wasn't screaming. This usually meant him emptying the contents of the fridge, pots and pans cabinet, or the pantry. 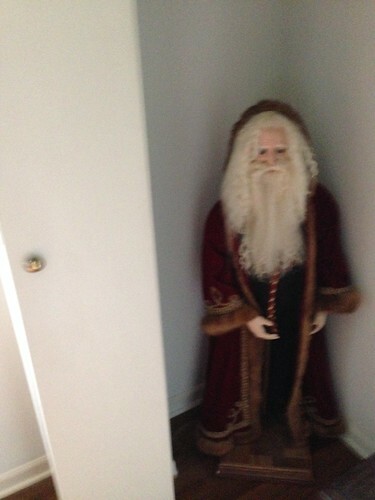 This is what is referred to as "excellent parenting skills" in case you were wondering. On the weekend I read both boys a haunting tale of some dogs that disappear and leave nothing but haunting shadows behind. I don't think this book was intending to be quite so mystically macabre but it succeeded nonetheless. As Elliott decided he didn't want to eat any more on Saturday night I was given a dessert of grandma's delicious lemon curd. At least I remember it being delicious last time I had some. This time, Martin would not allow me a single bite and ate the entire portion himself. 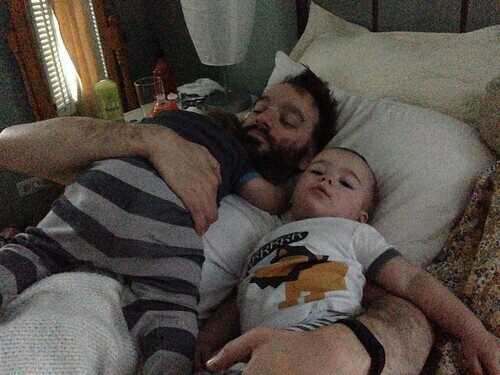 Sunday morning we slept in and Elliott was continuing to get better. He still had his moments but he was largely able to function, walk around, hit Pete on the head, and go about his normal activities. Before heading out to work we watched "The Fox" a few more times since they are now both obsessed with the video. Maybe this is just because we never really show them any videos so they'll take whatever they can get. However, 141 million views on YouTube probably means that they're just as transfixed by it as everyone else is. We also went for a walk in which I continue to be rendered speechless by Jen and her family's ideas on what a busy street is. In the above video you will see me referring to one of these streets deemed "too busy" to live near. Not even to live on. Apparently the dizzying rate of one-to-four cars an hour is far too much traffic to even consider having this street in your backyard. If I live to be a thousand years old I will not understand where these concepts comes from. They can get hand, foot, and mouth disease more than once.